The first workshop in the series planned in 2016 on the theme Follow-up and Review of Migration in the SDGs, was held in New York at the beginning of the year and discussed appropriate tools and mechanisms that will help Member States to measure progress on relevant migration-related SDG targets. Building on the conclusions of the first workshop, the second workshop, took place on 11-12 October 2016 in Geneva and focused on Assessing progress in the implementation process of migration related SDGs. 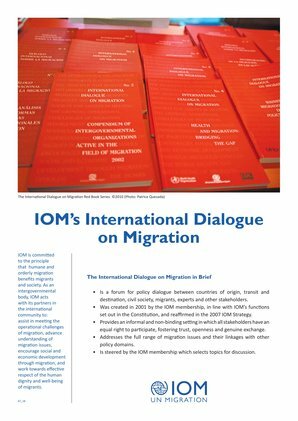 It discussed the results available of the tools and mechanisms presented in New York, including the IOM-EIU Migration Governance Index and the joint IOM-UNDESA indicator for measuring progress on migration related targets endorsed by the UN Statistical Commission. The workshop opened a space for IOM Member States and other stakeholders to share strategies, policies and measures that they are putting in place to reach migration related targets, including good practices, challenges, lessons learned and areas that need support and shared experiences. to inform International Organizations about how they could contribute to the process of achieving the SDGs. 10:00 – 11:40 Session 1: Migration in the SDGs – Where do we start and where should we go?